A motivational speaker and author will attempt to swim the English Channel this summer – a feat which has been achieved by less than half the number of people who have successfully scaled Mount Everest. Just 2,228 people have completed the 33-kilometre swim, which takes on average 12 to 14 hours, compared to 4,833 climbers who have reached Everest’s peak. 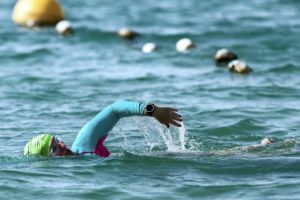 Julie Lewis, a 56-year-old Briton living in Abu Dhabi, originally applied to take part in a relay swim with four other UAE residents, but for one reason or another they all dropped out. Having already paid her deposit, she was faced with a choice: to convert her application to a solo swim, or abandon the attempt altogether….